Private equity mogul David Rubenstein says finding lucrative acquisitions is tough in this market. Still, Rubenstein explained that a lot of public companies are trading at record highs and sitting on a lot of cash, which makes them less inclined to sell. Private equity firms often finance acquisitions using large amounts of debt, and with interest rates still low, Rubenstein said it can be tempting for private equity to go big on borrowing. "It's a little frothy," he said of the private equity deal landscape, adding that about half of recent deals consist of one private equity firm taking over another. But compared to some of the mega deals in the tech world such as Facebook's $19 billion acquisition of messaging platform Whatsapp, private equity activity seems cheap, Rubenstein opined. 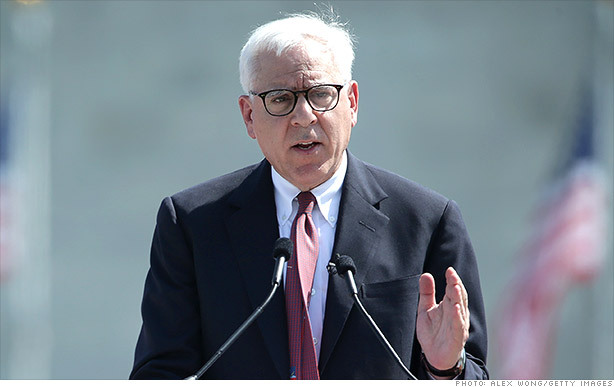 Rubenstein, for his part, is scouring the globe for deals, and is bullish on China. "It's welcoming to private equity," he said of the world's second largest economy. "For long-term investors, it's a great place to invest." As for Europe, Rubenstein called it "the biggest emerging market in the world." That's because investors abandoned the continent prematurely when the Eurozone crisis hit, he said. And now, it's looking pretty attractive from an investment standpoint. Despite the current challenge of finding good opportunities in the United States, Rubenstein believes the once-opaque world of private equity will continue to open its doors. "It's become a much more mainstream business," Rubenstein asserted. Whereas these kinds of investments are traditionally available exclusively to big pension funds, sovereign wealth funds, and the ultra-rich, Rubenstein wants smaller investors to get in on the action. While small investors are able to buy publicly-traded shares of private equity giants such as the Carlyle Group (CG), Blackstone (BX), and Apollo Global Management (APO), soon they'll be able to invest in the actual funds like the big guys, Rubenstein said. "That's an enormous growth opportunity for us," he said.